The vision for 5G is deeply flawed because users will not value the higher data rates that are promised and will not need the higher capacity forecast. It is flawed because technological advances are insufficient to realise the vision and because mobile operators are insufficiently profitable to afford it. This is the conclusion drawn by Professor William Webb, Director at Webb Search Consulting, CEO of the Weightless SIG, and President of the Institution of Engineering and Technology in 2014-15, in a new book entitled - The 5G Myth: When Vision Decoupled from Reality. In his book, Webb uses evidence-based analysis to argue that the current vision of 5G is badly flawed for the reasons given above, but notes that it is not in the interests of any of the stakeholders to point this out. Webb believes the vision of 5G that the industry is currently proposing is too utopian. 5G claims it will provide: incredibly fast Gbps speeds; incredible capacity – 1,000 x current networks capabilities; broadband everywhere; massive machine connectivity; ultra-low latency and complete reliability. Instead, Webb argues there is an alternative vision where industry focusses on consistent connectivity everywhere, as this will benefit society much more than providing ridiculously fast speeds in city centres. Webb points out that we are reaching a point where people have more video than they can ever manage to watch. And when do they view video on smartphones or tablets? Generally, on a commute to or from work and only then on a train or bus and often the video will be pre-loaded anyway. ‘Do we need a new wireless technology to deliver that? We can use 4G and new spectrum bands,’ says Webb. Because of this he thinks data growth is slowing and may plateau around 2027 with only 2x growth occurring during the 5G era. 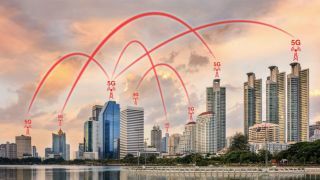 But if 5G is predominantly predicated on providing higher speeds and delivering substantially enhanced data capabilities, this suggests 5G may not be targeting the right areas. Wi-Fi can provide adequate coverage on trains and within buildings, while rural coverage can be provided by LTE in the 700/800MHz bands, he says. Webb points out that we live in a Wi-Fi first world, where everyone switches to Wi-Fi whenever possible, so why invest in an expensive new generation of technology? As for the massive machine connectivity promised by 5G, Webb argues that narrowband IoT technology, both cellular and unlicensed, can handle this perfectly adequately today – there is no need to wait for 5G - and the amounts of data are so small that they will only add 0.03% loading to a network. He questions the need for the other key 5G promise of ultra-low latency (less than 1ms), arguing that automotive connectivity can be delivered in other ways, and that most other use cases are typically indoors – VR and AR applications, for example. Adding tactile technology for things like remote robotic surgery is certainly a fascinating concept, but would there be enough of it to justify the investment economically? Webb also points out that current technology has improved dramatically over previous generations with 4G providing capacity enhancements of around 2.5x at very little extra cost, so most of the easy gains have already been achieved. In addition, the economics of the mobile industry have changed and while the rationale for operators to invest in new 4G technology made sense, as it does provide material benefits for subscribers, Webb believes that ‘without any clear benefits from 5G there is limited incentive for MNOs to upgrade their network’. ‘The new concept of 5G is still very ill-defined and yet Governments are happy to invest in this and are making policy decisions about something when we don’t even need it. We do need more capacity indoors, IoT solutions, improvements to rural coverage and a viable regulatory framework for provision of broadband communications where declining ARPUs still allow for investment,’ he says. He continues: ‘Sure, we’d all say yes to 4K video streaming to mobile - if it is economically viable. But if it costs the MNO to implement, then it has to charge more for that service, and people do not want to increase their ARPU. ‘There are lot of possible futuristic uses but if you have to pay for it would you actually then do it? It is an optimistic view to introduce new services and expect people will pay for it. It might happen, but it would have to be a really compelling use case,’ says Webb. The 5G exponents argue that if operators harness NFV and SDN and network slicing technology, then MNOs can offer specialised services to industry with guaranteed SLAs and bring in new revenues that way. In Webb’s view, 4G has a lot of legs yet and as MNOs are not increasing their revenues and their profitability is not that great, so as a result of this they are trying to minimise investment and sweat their existing assets for as long as possible. There will be some lead MNOs who will invest in 5G, but according to a research cited by Caroline Gabriel, market research and telecoms analyst at Real Wireless, in a blog (29 November 2016) Rethink Technology Research revealed that only 8% of MNOs intend to invest in 5G before 2020, with most waiting until after 2022. Summing up his intentions behind writing the book, Webb says: ‘My hope in doing this is to stimulate debate. There is a lot of hype from people with self-interested views on 5G. This is not criticism of them, I would do the same in their position, but I think there is a more sensible way forward. ‘I don’t suppose the final outcome will be what I am proposing, but I hope it will generate a wider discussion. It would be a brilliant win for society if we could get consistent coverage and speeds everywhere. Delivery of IoT nationwide would be transformational. These things would really change our lives and we could do some fantastic things if we can just realign the vision,’ says Webb. He points out that this doesn’t even require the MNOs to invest. If they haven’t invested in rural coverage in 30 years they won’t do it now. It never made economic sense to them, so rural investment has to come from Government, while the train operating companies need to sort out on-board train coverage. Finally, he argues the Government needs to provide a better regulatory approach that would allow mergers, deployment of shared networks and the emergency of various OTT and MVNO-like models – actions that would encourage innovation and investment within the limited economic means of the industry. More details, including a free download of the final chapter, are available on Professor Webb’s website at www.webbsearch.co.uk.